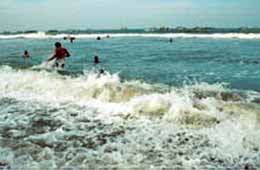 Poompuhar is situated 40 km from Chidambaram. The Kaveri, margin with the bellowing sea, was known as Puhar but due to the exquisite beauty of the port town, it can to be called ‘Poompuhar’. The greatness of the city is brought out in some of the poem in Sangam Literature. In order to conjure up the decorative ornamental scenic beauty of Poopuhar, the whole art gallery is maid to present the environment and atmosphere of the second century A.D. by the creation Illanji Manram, Pavai Manram etc. A fine beach and calm water offer good bathing. The department of tourism offers shell and conch shaped cottage to the tourist in the Poompuhar tourist complex, at a moderate tariff. Air: The nearest airport is Tiruchirappalli, which is situated at a distance of 160 km. Rail: The nearest railway station is at Mayiladuthurai is about 30 km (Mayavaram), Sirkali is 20 km. Road: Regular bus services are available. This entry was posted in Poompuhar, Tamil Nadu. Bookmark the permalink.